We’re so fortunate to be a part of this thriving KES village community which offers so many amazing ways to volunteer! Thank you to ALL of our volunteers who ensure this is a place where our children can flourish! Special recognition to our wonderful '18-'19 Exec. Board Members: Eileen Sullivan, Samantha Holcman, Kristin Condon, Sarah Becker, Leah DeSantis, Kathy Campbell, Doreen Siciliano, Jessica Binney, Precious Ruppenstein, Kerry McGill & Kristen Lawton. A round of applause to our fantastic Principal Cristy Harris, our terrific Assistant Principal Kweon Stambaugh and our fabulous PTO teacher liaisons Kim Buckley (representing the lower grades) & Lynn Garofalo (representing the upper grades) for their unending dedication and commitment to making KES an amazing place to be. Special thanks to KES Secretaries Debbie Winter & Maria Horton and Custodian, George Cook, who are always available to help whenever needed. We'd also like to acknowledge Janine LaFond, our parent volunteer Webmaster who continually helps us with our new PTO website. If you've been to a PTO General Membership meeting this year, thank you for coming! We hope you've noticed the new, collaborative, round-table style seating which really fosters discussion. If you haven't yet attended a meeting, please join us at the next one as there is terrific information shared! If you have any interest in getting involved/volunteering, please reach out! 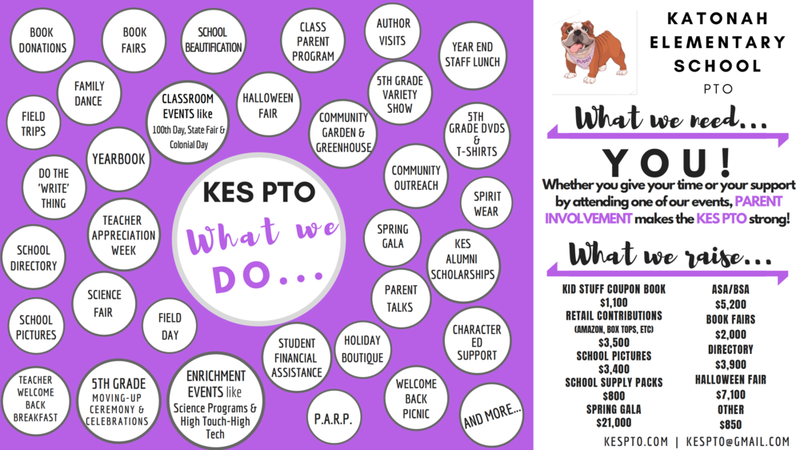 The image is our year at a glance- what the PTO raises and contributes to Katonah Elementary School. Thank you for all your time, support and involvement in making the PTO strong!